Margarine was invented in France at the instigation of Napoleon III who wanted to find a cheap substitute for butter to feed the poor, the soldiers and the other ‘common’ people. When first marketed sales were slow as margarine was in direct competition with butter and it looked and tasted inferior. The main advantage seemed to be that it spread easily straight out of the cool house (later the refrigerator). However, in the early fifties when the “Cholesterol Bogeyman” was invented by Dr.Ancel Keyes, things began to improve. Margarine was then marketed as a health food. Eating it promised a longer life free of heart and blood vessel disease. Today, the propaganda continues and supermarket shelves are overflowing with many different kinds of margarine. Shelf life is very long and it still spreads easily straight from the fridge. However, while in the early days it was made from whale oil, tallow or lard (and thus had considerable nutritional value), today it starts its life as cheap vegetable oil (often pesticide-soaked cottonseed oil); it is processed aggressively by repeated heating to extreme temperatures, by the addition of toxic chemicals and coloring agents. It is degummed, bleached and deodorized. However, during processing several undesirable things happen: While adding hydrogen gas to the oil mixture in order to ‘hydrogenate’ it, meaning to chemically change it into a more solid state, the natural cis configuration of fatty acids is changed to an unnatural ‘trans’ configuration. These high trans fat margarines have a higher melting point and practically keep forever. Since our bodies are not able to deal with these trans-fats properly the ‘funny fats’ or ‘phony fats’ do much serious damage to cell membranes, blood cells, blood vessels and they interfere with prostaglandin production. When trans fats are ingested the body responds by mounting an immune defensive reaction, practically creating a state of war in the system. As long ago as 1974 it was proven that margarine is a significant cause of atherosclerosis (blood vessel disease), high blood pressure and cancer. In Germany, trans fats are limited by law to less than 1% in any food, including fast foods. In Australia, some products contain over 40% trans fats. Place a tub of margarine outside your house and you will find that no animals or insects show any interest. As to the health claims made – this cocktail of damaged, unnatural oils with a high content of toxic chemicals is in no way conducive to good health. 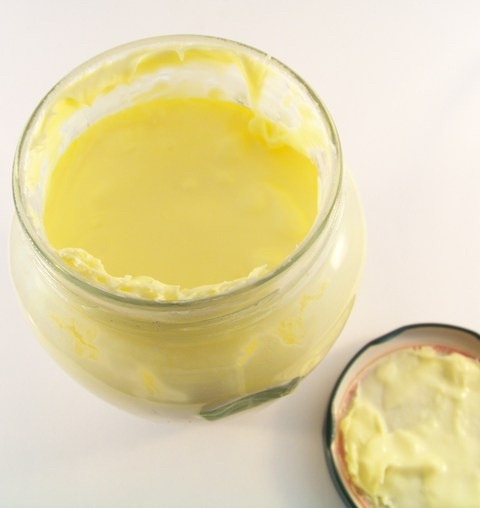 As to its alleged positive effects on cholesterol: Some margarines do lower cholesterol in some people, however, the benefits of lowering cholesterol have been – to put it mildly- obscenely overstated. BUTTER has been used for centuries. Because is a saturated fat, it is very stable. It also is totally natural, nutrient-rich product made up of a mix of many different fatty acids. It contains antimicrobial and antifungal substances as well as a very potent anti-cancer agent called conjugated linoleic acid (CLA). Butter contains lecithin and antioxidants including Vitamins A and E, also selenium. All are strong health-promoting nutrients. Butter contains cholesterol, also a powerful antioxidant, which protects against heart disease (Yes, that is true!). Butter contains nearly 500 different fatty acids; each has its own role in nourishing the body. Thus, the nutrients in butter protect against heart disease, cancer and other degenerative diseases. Butter helps to protect the thyroid gland as it contains iodine, it fights fat storage through CLA, and butter contains several growth factors and plays a critical role in the development of the nervous system and the brain. All the nutrients in butter make it an essential food, capable of supplying many of our daily nutrient needs. Butter is not man-made, it is natural, of extremely high biological value and –compared to margarine-in a league that’s light years ahead. Butter can be made from just about any milk, e.g. buffalo, goat, sheep, camel…. In Canada and many parts of Europe goat butter is available in stores. Butter tastes good, looks good and it sustains life. Now you know. Margarine or butter – the choice is yours!